Intense Pulsed Light, or IPL, improves the appearance of photo-aged skin on the face and body with little-to-no down time. By treating broken capillaries and age spots (sun-induced freckles), IPL creates smoother looking skin through a process called photo-rejuvenation. 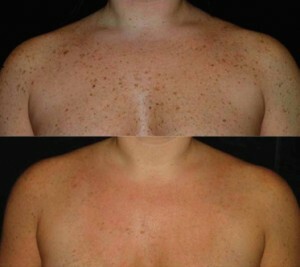 IPL removes redness and brown spots on the face, neck, hands, chest, arms and legs. 4 treatments at 3-4 week intervals are required. Buy 3 and get 4th treatment free!